To run a CRDB on installations from the RS download package, setup two RS installations and continue from Step 2. Note: This getting started guide is for development or demonstration environments. To setup CRDB in a production environment, use the instuctions for creating a CRDB. The -p options map the web UI port (8443), REST API port (9443), and database access port differently for each container to make sure that all containers can be accessed from the host OS that is running the containers. For cluster 1, direct your browser to https://localhost:8443 on the host machine to see the Redis Enterprise Software web console. Simply click the Setup button on the page to get started. Note: Depending on your browser, you may see a certificate error. Continue to the website. On the node configuration page, select your default settings and provide a cluster FQDN, for example cluster1.local. Then click Next button. Click OK to confirm that you are aware of the replacement of the HTTPS SSL/TLS certificate on the node, and proceed through the browser warning. In your web browser, go to https://localhost:8445 to set up the cluster 2. For the Cluster name (FQDN), enter a different name, such as cluster2.local. Now we have two Redis Enterprise Software clusters with FQDNs cluster1.local and cluster2.local. 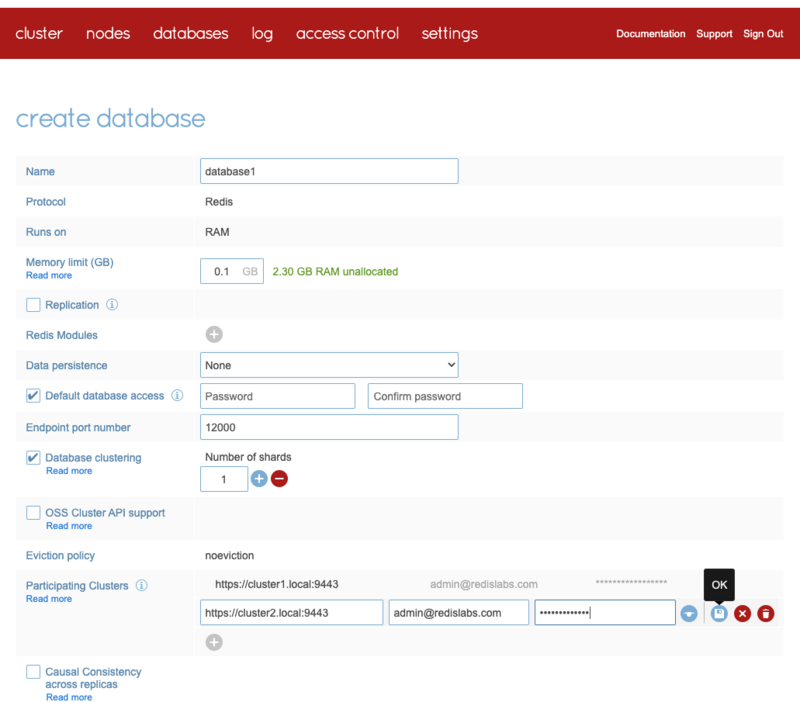 After you login to cluster1.local, select the Redis database and deployment type Geo-Distributed. Then click Next. Make sure the Database clustering is enabled and select the number of shards that you want to have in the database. When database clustering is enabled, databases are subject to limitations on Multi-key commands. You can increase the number of shards in the database at any time. Clear the Database clustering option to use only one shard and so that the Multi-key commands limitations do not apply. Note: You cannot enable or disable database clustering after the CRDB is created. Click Activate to create your CRDB. Note: If you cannot activate the database because of a memory limitation, make sure that Docker has enough memory allocated in the Advanced section of Docker Settings. After the CRDB is created, you can now visit each cluster 1 at http://localhost:8443 and cluster 2 at http://localhost:8445. 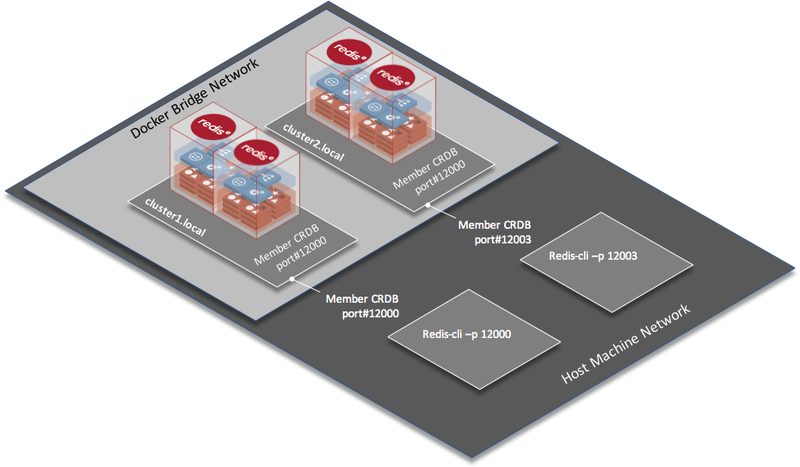 Make sure that each cluster has a CRDB member database with the name database1. In a real-world deployment, cluster 1 and cluster 2 would most likely be in separate data centers in different regions. However, for local testing we created the scale-minimized deployment using two local clusters running on the same host. redis-cli is a simple command-line tool to interact with redis database. Enter exit to exit the redis-cli context and enter exit again to exit the RS container of node 1 in cluster 1. To see that the key replicated to cluster 2, repeat the steps to switch your context into the RS container of node 1 in cluster 2, run the redis-cli and retrieve key1. A simple python application running on the host machine can also connect to the database. Note: Before you continue, you must have python and redis-py (python library for connecting to Redis) configured on the host machine running the container. In the command-line terminal, create a new file called "redis_test.py"
Paste this code into the "redis_test.py" file. This application stores a value in key1 in cluster 1, gets that value from key1 in cluster 1, and gets the value from key1 in cluster 2.